posted by Billie Owens in business, agriculture, trade. Washington, D.C., April 18 -- U.S. Trade Representative Robert Lighthizer and Secretary of Agriculture Sonny Perdue announced today that a World Trade Organization (WTO) dispute settlement panel found that China has administered its tariff-rate quotas (TRQs) for wheat, corn, and rice inconsistently with its WTO commitments. Contrary to those commitments, China’s TRQ administration is not transparent, predictable, or fair, and it ultimately inhibits TRQs from filling, denying U.S. farmers access to China’s market for grain. “This second important victory for the United States further demonstrates that President Trump will take all steps necessary to enforce trade rules and to ensure free and fair trade for U.S. farmers. The Administration will continue to press China to promptly come into compliance with its WTO obligations,” said Ambassador Lighthizer. China’s grain TRQs have annually underfilled. USDA estimates that if China’s TRQs had been fully used, it would have imported as much as $3.5 billion worth of corn, wheat and rice in 2015 alone. Upon accession to the WTO, China made commitments specific to its administration of TRQs, including the commitment to administer its TRQs in a transparent, predictable, and fair basis, using clearly specified administrative procedures and requirements that do not inhibit the filling of each TRQ. In August 2017, the United States requested that the WTO establish a dispute settlement panel to consider whether China administers its TRQs for long-grain rice, short- and medium-grain rice, wheat, and corn in a manner inconsistent with its WTO commitments. Today’s panel report agrees with the United States that China administers its TRQs in a manner inconsistent with its Accession Protocol obligations, through its eligibility criteria, allocation and reallocation procedures, public comment process, and processing restrictions. In addition, China allocates a significant portion of each TRQ to a designated state-trading enterprise (STE) and does not subject the STE to the same rules applied to non-state trading enterprises applying for and importing grains under the TRQs. Each finding individually established that China’s TRQ measures are inconsistent with its obligations. Compliance with WTO rules will lead to market-oriented TRQ administration and improved access for U.S. and other exporters, overall creating a more level playing field. posted by Billie Owens in business, agriculture, news. (Washington, D.C., April 17) -- U.S. Trade Representative Robert Lighthizer and U.S. Secretary of Agriculture Sonny Perdue announced today that the government of Tunisia and the United States have finalized U.S. export certificates to allow imports of U.S. beef, poultry, and egg products into Tunisia. This announcement follows meetings between U.S. and Tunisian officials on the safety and wholesomeness of U.S. beef, poultry, and egg products. In 2018, U.S. exports of agricultural products to Tunisia exceeded $264 million. Over 90 percent of exports were corn, soybeans, or corn and soy products. Initial estimates are that Tunisia would import annually $5-10 million of beef, poultry, and egg products from the United States, with additional growth over time. More details on requirements for exporting to Tunisia are available from the USDA Food Safety and Inspection Service Export Library. posted by Billie Owens in business, agriculture, 2018 Farm Bill. (Washington, D.C., April 12, 2019)— U.S. Secretary of Agriculture Sonny Perdue today announced the implementation status of the 2018 Farm Bill. President Trump signed this Farm Bill into law on Dec. 20th, 2018 and the U.S. Department of Agriculture (USDA) promptly began implementation of key programs. “At USDA we are implementing the 2018 Farm Bill as quickly as possible. We know the programs that are renewed and updated in this farm bill are critical to farmers, ranchers, and producers as they plan for the future,” said Secretary Perdue. “Our mission areas have all held several public listening sessions, both formally and informally, to receive stakeholder input. posted by Billie Owens in business, agriculture, 2017 Census of Agriculture. (WASHINGTON, D.C., April 11) – The U.S. Department of Agriculture (USDA) today announced the results of the 2017 Census of Agriculture, spanning some 6.4 million new points of information about America’s farms and ranches and those who operate them, including new data about on-farm decision making, down to the county level. Ask the Census Experts #StatChat on Friday, April 12 at 1 p.m. ET. “We are pleased to deliver Census of Agriculture results to America, and especially to the farmers and ranchers who participated,” said U.S. Secretary of Agriculture Sonny Perdue. “We can all use the Census to tell the tremendous story of U.S. agriculture and how it is changing. “The Census shows new data that can be compared to previous censuses for insights into agricultural trends and changes down to the county level,” said NASS Administrator Hubert Hamer. “While the current picture shows a consistent trend in the structure of U.S. agriculture, there are some ups and downs since the last Census as well as first-time data on topics such as military status and on-farm decision making. For the 2017 Census of Agriculture, NASS changed the demographic questions to better represent the roles of all persons involved in on-farm decision making. As a result, in 2017 the number of producers is up by nearly 7 percent to 3.4 million, because more farms reported multiple producers. Most of these newly identified producers are female. While the number of male producers fell 1.7 percent to 2.17 million from 2012 to 2017, the number of female producers increased by nearly 27 percent to 1.23 million. This change underscores the effectiveness of the questionnaire changes. The Census tells the story of American agriculture and is an important part of our history. First conducted in 1840 in conjunction with the decennial Census, the Census of Agriculture accounts for all U.S. farms and ranches and the people who operate them. After 1920, the Census happened every four to five years. By 1982, it was regularly conducted once every five years. Today, NASS sends questionnaires to nearly 3 million potential U.S. farms and ranches. Nearly 25 percent of those who responded did so online. Conducted since 1997 by USDA NASS – the federal statistical agency responsible for producing official data about U.S. agriculture – it remains the only source of comprehensive agricultural data for every state and county in the nation and is invaluable for planning the future. posted by Billie Owens in GMOs, food processing technology, education, GCC, agriculture, news. What is a GMO? And perhaps more importantly, should you be worried about them? GMOs, or genetically modified organisms have found their way into most of the foods we consume -- from plants and vegetables to animal products such as meat, milk, honey and seafood. So, where can you as a consumer, farmer, gardener or everyday citizen, get information and learn about the variety of perspectives on GMOs? The Genesee County Farm Bureau and the Science Department at Genesee Community College have partnered to present "Genesee County Talks GMOs" from 6 to 8 p.m. on Thursday, April 25 in Room T102 of the Conable Technology Building on GCC's Batavia Campus. Guests will see a free screening of "Food Evolution," written and produced by Trace Sheehan and Scott Hamilton Kennedy, and narrated by Neil deGrasse Tyson. "Food Evolution" is an impactful examination of the world's current, yet vastly varying, views on GMOs, and the risks we take every day in believing or not in the information we are presented with. Anyone interested in learning even more about how food is produced is encouraged to explore GCC's Food Processing Technologies program (FPT). GCC recently received a highly sought-after State University of New York (SUNY) needs grant and completed significant upgrades to student laboratories and equipment to provide the most up-to-date learning experiences. GCC's FPT program was designed not only to prepare students to enter the workforce immediately, but to position them perfectly for a seamless transfer into a four-year degree program at any number of institutions both within and outside of the SUNY system. Learn more about GCC's Food Processing Technology Associate in Applied Science Degree or contact [email protected] today. posted by Billie Owens in business, agriculture, USDA. “Customer service is our top priority at USDA and these new features will help our customers as they manage their farm loans and navigate the H-2A temporary agricultural visa program,” Secretary Perdue said. “In my travels across the country, I have consistently heard people express a desire for greater use of technology in the way we deliver programs at USDA. You may view the video at this link. posted by Billie Owens in Byron-Bergen FFA, agriculture, news. On Saturday, March 16, the Western Regional Sub State Leadership Development Event came to Byron-Bergen High School. Despite the Byron-Bergen chapter of the Future Farmers of America only being in its second year, they hosted chapters from all over Western New York State at the prestigious event. Byron-Bergen FFA members volunteered throughout the day running the event and acting as ambassadors for the local community. Visiting students completed in Prepared Public Speaking, Extemporaneous Public Speaking, Employment Skills, Agricultural Issues Forum, and more. Judges included experts in their field from throughout Genesee County, as well as Byron-Bergen Superintendent Mickey Edwards, who judged the Employment Skills competition. posted by Billie Owens in agriculture, local produce, news, business, Taste NY. Governor Andrew Cuomo today announced that Taste NY Farm Markets will begin at New York State Thruway service areas for the 2019 season on Monday, April 1. The Taste NY Farm Markets will promote the world-class food and beverage products found around the State. The Thruway Authority and New York State Department of Agriculture and Markets are continuing this annual offering of the finest locally grown produce from New York's farms. "Taste NY is an economic engine in every corner of the state and has expanded New York's booming agriculture industry," Governor Cuomo said. "These farm markets at Thruway service areas will provide farmers and producers a unique opportunity to showcase their products to millions of tourists, supporting the growth of farms and small businesses across the Empire State." "From maple syrup, to dairy, to fruits and vegetables, New York produces an amazing variety of high-quality agricultural products," said Lieutenant Governor Kathy Hochul. "Our Taste NY program showcases the best we have to offer, and we are looking forward to another season providing travelers with fresh, locally-grown products at stops along the Thruway." The New York State Thruway features outdoor farm market locations at service areas across its 570-mile system. In 2018, a dozen local producers from regions across New York State participated in the markets at 20 service areas, reaching millions of visitors who travel the Thruway throughout the Spring, Summer and Fall. Customers will have access to locally grown fruit, vegetables, honey, maple syrup, nuts, butter, cheese and more depending on availability. Only produce grown or produced in New York State may be sold. Market days and hours of operation are dependent on product availability and weather. Motorists are encouraged to visit thruway.ny.gov for locations, hours, participating farms and available products. Genesee County vendors interested in selling food products at Taste NY Farm Markets should email [email protected] for more information on how to participate this season. State Agriculture Commissioner Richard Ball said, "We thank Governor Cuomo and Executive Director Driscoll for supporting Taste NY and providing our farmers and producers with a platform to showcase their top-notch products and reach new markets. "The start of the farm market season is a reminder of our rich and longstanding tradition of agriculture and its economic impact in New York State." Thruway Authority Executive Director Matthew J. Driscoll said, "Our service areas offer a unique setting which can reach millions of people from across the state, country, and world. The Thruway Authority is proud to support the Taste NY initiative by providing a venue where our local farmers and producers can sell their goods to the traveling public." The Taste NY initiative has seen steady growth and recognition since it was created in 2013 by Governor Cuomo. The program reported sales of $1.5 million in 2014, tripled those figures to $4.5 million in 2015, and $13.1 million in 2016. In 2017, Taste NY saw producer sales grow to a record $16.1 million. Taste NY, which is overseen by the Department of Agriculture and Markets, has created opportunities for local producers to showcase their goods at a variety of venues throughout the State and at large public events, such as the Great New York State Fair and the Barclays Tournament at Bethpage State Park. It has also helped the farms and companies participating in the program to reach more customers, increase online sales, and, in many cases, expand the processing capacity of their business. Taste NY's food and beverage businesses also support the State's farmers by using New York grown and produced ingredients in their products. posted by Howard B. Owens in Barniak Farms, agriculture, Bethany, news. 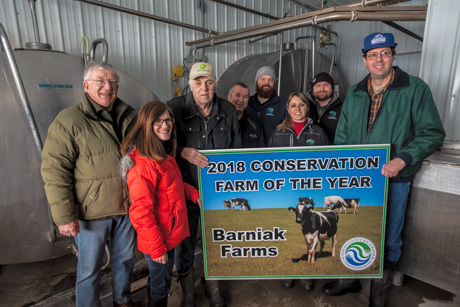 Barniak Farms has been selected by the Genesee County Soil and Water District as the 2018 Conservation Farm of the Year. Brad Mudrzynski, with Soil and Water, said the farm was selected because of what it does to protect soil health and the watershed, such as planting cover crops, which helps prevent erosion, builds soil health, and prevents phosphorous from leaching into streams and creeks. The farm on East Road in Bethany is 1,700 acres and milks about 700 cows. Soil and Water, founded in Genesee County in 1944, handed out its first farm conservation award in 1959. Photo: Ted Konieczka, Laura Bestehorn, Joseph Barniak, Barry Flansburg, Brad Mudrzynski, Molly Cassatt, Tim Welch and Kenneth Barniak. posted by Virginia Kropf in Chamber Awards, business, agriculture, upstate niagara. Editor's note: The 2018 Genesee County Chamber of Commerce Awards banquet will be held Saturday, March 2, at the Quality Inn & Suites in Batavia. Upstate Niagara Cooperative Inc., a dairy cooperative owned by 340 farm families located throughout Western New York, will be honored March 2 as the Genesee County Chamber of Commerce’s Agricultural Organization of the Year. Upstate Niagara Cooperative is a result of several mergers, acquisitions, and consolidations of local dairy processors over the past 100 years, as dairy farmers realized the need for increased efficiencies to be able to grow their businesses and compete in the changing marketplace, Telaak said. In 2006 Upstate Farms Cooperative and Niagara Milk Cooperative consolidated, bringing together two of the nation’s top dairy cooperatives. Its history, however, goes back even further. Some of Upstate Niagara Cooperative’s family-owned farms have been in existence for more than six generations, according to Telaak. The cooperative operates seven manufacturing facilities – three fluid plants (Buffalo, Rochester and Williamsport, Pa.), with their main office in Buffalo; two cultured facilities (West Seneca and North Lawrence); one cheese plant in Campbell; and O-AT-KA Milk Products in Batavia. The Membership Office is also located in Batavia, Telaak added. 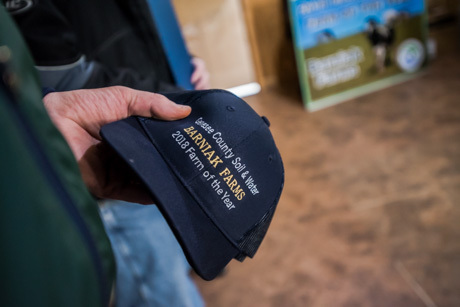 “Our mission is to serve each one of our customers the highest quality dairy products and services, in order to market milk and maximize returns for our dairy farmer owners, while providing a rewarding environment for our employees,” Telaak said. Upstate Niagara’s high-quality dairy products have earned several first-place awards at dairy competitions, including their Bison French Onion Dip and light sour cream. They are marketed to consumers throughout the country. Their products include milk, flavored milk, yogurt, dip, sour cream, cheese and ice cream marketed under the Upstate Farms, Valley Farms; Intense Milk for consumers looking for a healthier way to indulge; Bison; and Milk for Life. “We are also a private label manufacturer of dairy products for many of the largest retailers throughout the country,” Telaak said. Today, Upstate Niagara employs more than 1,400 people in their offices, manufacturing facilities and distribution network. Batavia was chosen as the site for the Membership Office because of its central location to member farmers in Western New York, Telaak said. Mike Davis is plant manager of the Batavia plant. posted by Howard B. Owens in michael ranzenhofer, farm labor bill, business, agriculture. Senator Michael H. Ranzenhofer has shared his concerns with recently reintroduced legislation, the Farmworkers Fair Labor Practices Act (S2837), in a letter to the bill’s Senate sponsor, Senator Jessica Ramos. Senator Ranzenhofer is requesting that the bill’s sponsor garner feedback from the agriculture industry. Senator Ranzenhofer believes that the proposal could have a devastating impact on local jobs and family farms. “Simply put, the stakes have never been higher for farmers across New York State and additional employer mandates could have catastrophic consequences for many rural Upstate communities and consumers,” Ranzenhofer said. posted by Billie Owens in Ag District 3, Le Roy, bergen, Pavilion, Stafford, business, news, agriculture. The state mandated 30-day public review period has begun for Agricultural District No. 3 in the towns of Le Roy, Pavilion, Stafford and Bergen. The Genesee County Agricultural and Farmland Protection Board announced that Agricultural District No. 3 would embark on its eight-year review with a 30-day public review period beginning on Jan. 26. As with every eight-year review, landowners with lands in the district under review will be asked to complete a worksheet where they will be given the option to enroll or withdraw property from the district. Only entire parcels can be included or excluded. Landowners will receive the worksheet, along with a letter, informational brochure, and map of the current district boundaries in the next couple of days. Each landowner will have until Monday, Feb. 26thof this year to mail the worksheets to the Department of Planning in the envelopes provided. This deadline also coincides with the deadline for the Annual Enrollment Period which allows for inclusion of predominantly viable agricultural land to any of the County’s Agricultural Districts pending review by the Agricultural and Farmland Protection Board. In addition, nearby landowners that are receiving Agricultural Tax Assessments and are not part of the Agricultural Districts Program will be mailed a letter and form inviting them to join the program. During this 30-day period, a map of the District will be on file and open to the public in the office of the Genesee County Clerk and at the Genesee County Department of Planning. Any municipality whose territory encompasses the above Agricultural District, any State Agency or any landowner within or adjacent to the District, may propose a modification of the District during this period. The District and any proposed modification will be submitted to the Genesee County Agricultural and Farmland Protection Board for review. Consequently, a public hearing on the District and any proposed modifications will be held on Wednesday, May 8, at 5:30 p.m. at the Genesee County Old Courthouse, 7 Main St., Batavia. At the conclusion of this review, the Genesee County Legislature will vote on any modifications to the District and send the proper materials to the State Department of Agriculture and Markets for recertification. The public is encouraged to attend all open meetings. By enrolling land in the Agricultural Districts Program, participating farmers can receive relief from nuisance claims and certain forms of local regulation. Enrollment is free and voluntary. For a free informational brochure, please contact the Genesee County Department of Planning. Phone: (585) 815-7901; Fax: (585) 345-3062; Email: [email protected] Visit on the web here. posted by Billie Owens in business, agriculture, precision-agriculture. Registration closes on Feb. 13 for the third annual Precision Ag Workshop focused on "Turning Data into Dollars." The 2019 Precision Ag Workshop is presented by The BEST Center (Business and Employee Skills Training) at Genesee Community College, which has been dedicated to supporting employers and employees for more than 15 years. The workshop is open to everyone and registration, which includes lunch and materials, costs $59. Participants can register by phone at 585-345-6868 or in person at The BEST Center, One College Road in Batavia. The workshop runs from 9 a.m. 'til 3 p.m. on Wednesday, Feb. 20, in Room T102 of the Conable Technology Building on Genesee Community College's Batavia Campus and features keynote speaker Bob Stewart, management partner at Stewart Farms in Yorkville, Ill.
Based on his experience with finance, land owner relations and production, Stewart will present "Our Farm's Precision Ag Experience: What Works for Us and What Still Needs Work." "The data collected in the Ag industry is critical not only to yield and operations, but when analyzed and applied properly, can really take the business to the next level," Reid Smalley, executive director of Workforce Development said. "The BEST Center has put together this workshop to expose participants to new and innovative ways to employ the data already being collected and to maximize its value to any operation." The BEST Center provides businesses and organizations with customized training solutions ranging from supervisory skills to technical training. The Center also offers numerous professional and personal development courses for individuals, including classroom and online opportunities. posted by Billie Owens in business, agriculture, news, CDL training. Cornell Cooperative Extension of Genesee County, in collaboration with Genesee Valley Educational Partnership, will be offering a Commercial Driver's License Training Program for Genesee County agriculture producers and their employees for Class A and Class B licenses. This training program is designed for agriculture producers and farm employees that have already have some experience with commercial truck operation. An informational meeting will be held on Jan. 31 at 7 p.m. at the Cornell Cooperative Extension building at 420 E. Main St., Batavia. This meeting will explain how the program works and answer any questions you may have. The required training materials and medical forms will also be passed out at this time. Classroom instruction dates are Feb. 6 and 7, from 7 to 9 p.m. at the Cornell Cooperative Extension building located at 420 E. Main St. in Batavia. Drive time will be scheduled with the instructor at a later date. Full payment (check or cash) is due at the class on Feb. 6. The cost for Class A is $775 and the cost for Class B is $600. Registration is required and will be accepted until Jan. 25 or until the class is full. Class size is limited. For more information or to register, contact Jan Beglinger at 585-343-3040, ext. 132, or Brandie Waite at ext. 101.
posted by Billie Owens in Great Lakes Restoration Initiative, NRCS, news, agriculture, conservation, business. Tammy Willis, acting state conservationist for the U.S. Department of Agriculture’s Natural Resources Conservation Service (NRCS) in New York State, has announced funding to help protect the Great Lakes as part of the Great Lakes Restoration Initiative (GLRI). NRCS will provide financial and technical assistance to help improve surface water quality in waters flowing into Lake Ontario. The Great Lakes Restoration Initiative funding is provided by the Environmental Protection Agency (EPA) to allow NRCS to target threats to the Great Lakes. In New York, the GLRI area includes portions of Niagara, Orleans, Monroe, Wayne, Cayuga, Oswego, Genesee, Livingston, Ontario, Wyoming, Steuben, and Allegany Counties, which drain into Lake Ontario. NRCS in New York receives funding to provide financial and technical assistance through the Environmental Quality Incentives Program (EQIP) to eligible landowners and farmers for conservation work. GLRI focuses on practices that have the highest benefit for reducing water quality degradation due to agricultural runoff, including animal waste storage facilities, residue management, no-till, and nutrient management. Applicants applying to implement practices to address farmstead resource concerns associated with livestock operations must provide a copy of their Comprehensive Nutrient Management Plan to NRCS by Jan. 18. For fiscal year 2019, NRCS will accept applications for funding through Jan. 18. Applications accepted after Jan. 18 will be considered for funding in the next signup period. To apply for funding through the GLRI program interested farmers and landowners should contact their local USDA office by the above listed signup date. For more information on GLRI visit this website. If you are interested in applying for a conservation program please visit this website for information on applying. You may apply by visiting your local NRCS field office, which can be located using this website. posted by Billie Owens in news, business, agriculture, conservation, NRCS. The U.S. Department of Agriculture’s Natural Resources Conservation Service (NRCS) in New York State announces Jan. 18 as the application cutoff date for the general signup for the Environmental Quality Incentives Program (EQIP) for Fiscal Year (FY) 2019. Through the EQIP program, NRCS offers financial and technical assistance to participants to implement practices which address priority resource concerns, including soil erosion, water quality and habitat degradation. Focus areas within the EQIP program include the farmstead, soil management, habitat, forestry and grazing. Examples of practices implemented through EQIP include: strip cropping, grassed waterways, forest stand improvement and manure storage facilities. Applicants applying to implement practices to address farmstead resource concerns associated with livestock operations must provide a copy of their Comprehensive Nutrient Management Plan to NRCS by Jan. 18. Applicants applying to implement forest management practices must provide their Forest Management Plan by Jan. 18. NRCS will work with applicants to review potential resource concerns on the land included in the application and to develop a conservation plan to address the identified resource concerns. Applications accepted after Jan. 18 will be considered in the next signup. All applications are competitive and ranked based on national, state and locally identified resource priorities and the overall benefit to the environment. If you are interested in applying for an NRCS conservation program, please visit this website for information on applying.